Melanie Kisten Dance Academy together with Panache Promotions and Glow TV will present their recent successful production. 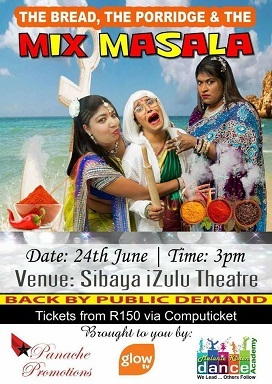 The Bread, The Porridge & The Mix Masala, back in Durban by public demand. This is a family show containing drama, dance and comedy. The production will take place on June 24 at 15h00 at the iZulu Theatre, Sibaya. Tickets from R150 booked through Computicket.